The paintings were engraved into the rock in the form of small dots and depict hunting scenes like those found in shamanic depictions. They may represent a link between the Neolithic period and Ancient Egyptian culture. The discovery earned the scientists the award for one of the current ten most important archeological discoveries in Egypt from the Minister of Antiquities in Cairo. For more than 100 years, Qubbet el-Hawa (English: hill of wind) has been a magnet for archeology. Over 80 burial mounds have been uncovered on the hill near Aswan in Egypt during countless excavations. The history of this necropolis for the provincial capital Elephantine extends from around 2200 to the 4th century BC. It was an important trading base for Egyptians in Nubia, and their nobles were buried in the burial mounds. Prof.
Elmar Edel from the University of Bonn investigated and documented the necropolis from 1959 to 1984. “The majority of the objects in the Egyptian Museum in Bonn come from these field campaigns,” reports Prof. Ludwig Morenz, who heads Egyptology at the Bonn alma mater. A completely new aspect at Qubbet el-Hawa has now been uncovered during an excavation begun at the necropolis in 2015. The team led by Prof. Morenz with Amr El Hawary, Andreas Dorn, Tobias Gutmann, Sarah Konert and David Sabel discovered much older Neolithic rock art from the 4th millennium BC. “Style and iconography provide solid clues when dating these,” says the scientist. while others are clearly pre-Egyptian as regards the presentation method and motif. The images were pecked into the rock with a hard point and are now barely perceivable due to their considerable age. Only the archeologically precise recording of the traces and the drawing of the outlines revealed the images with noteworthy iconography. The initially confusing-looking arrangement of dots allows three figures to be seen upon closer inspection: a hunter with bow, a dancing man with raised arms and, between them, an African ostrich. “The archer clearly shows hunting for the large flightless bird, while the man with raised arms can be identified as a hunt dancer,” reports Prof. Morenz. The dancer apparently wears a bird mask. The scene is reminiscent of the conceptual world of hunting, masks and shamanism, as known from many parts of the Earth – including of ostrich hunting by what are known as San (bushmen). “This social practice and the associated complex of ideas have barely been looked at in Egyptology,” says Prof. Morenz. Small painted female figures with dancing, raised arms and a bird mask also come from the 4th millennium BC, and some clay masks were discovered a few years ago in the Upper Egyptian Hierakonpolis. 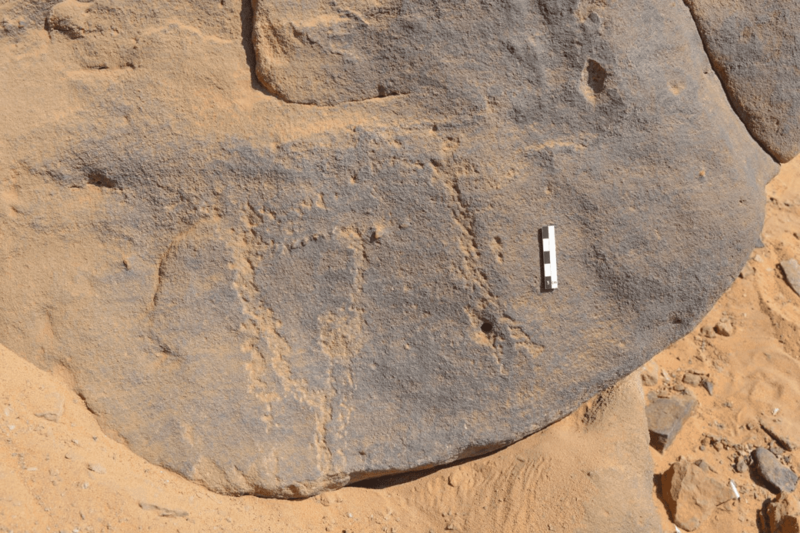 These finds show astounding consistency with the rock paintings of Qubbet el-Hawa. They may represent a link between the ancient Near Eastern and even southern European Neolithic period and Ancient Egyptian culture. “This opens up new horizons for research,” says Prof. Morenz. However, the finds need to be investigated more closely. The much older rock art clearly has nothing to do with the necropolis directly and is probably linked to a prehistoric network of trails that also needs to be researched more intensively.